There are some songs that, even if you'd never heard them before, you would instantly know when they were released. This week in 1984, a tune that is the epitome of mid-'80s pop debuted on the ARIA singles chart. Guess who had their teeth whitened before this video shoot? Bright, upbeat and optimistic, the track bounced all the way up the top 50 to the number 1 spot. Although already successful, the duo behind the mega-hit became one of the biggest acts in the world as a result. Spending the first of three weeks at number 1 this week in 1984 was "It's Just Not Cricket" by The Twelfth Man, the record which would eventually make way at the top for this week's newcomer. Previous single "Love In A Box" had made the top 50, but this latest release from Get Some Fun, which I actually prefer, bombed out just as the band's farewell tour was drawing to a close. The Liverpool, England band's second UK top 10 hit was also their second to reach the Australian top 100. "The Killing Moon" was lead single from fourth album Ocean Rain. Why this particular song was the one to break the US country legends' chart drought in Australia and not any of their previous 12 Billboard country chart number 1s is unclear. Like their previous two singles, "Confusion" and "Blue Monday", this was another stand-alone 12" release, but the lowest-charting of the three. Looks like Australia skipped over the video-less "I'll Wait" and followed "Jump" with the third single from 1984 instead. Despite being one of their best-known songs, "Panama" wasn't a success here. 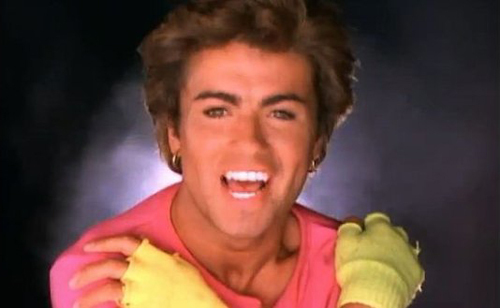 Number 50 "Wake Me Up Before You Go-Go" by Wham! In my flashbacks to 1992, we've just reached the point where George Michael was about to embark on his protracted legal dispute with Sony Music. That wasn't his first battle with a record company. In 1983, while still in Wham!, George and partner Andrew Ridgeley had sued original label Innervision over their initial contract. They were able to extract themselves from that deal with relative ease and, in 1984, released their first single for new record company Epic Records. That song was "Wake Me Up Before You Go-Go", a bright and sunny (like Doris Day) tune that was quite different from the more angsty "Wham Rap! (Enjoy What You Do)" and "Bad Boys". Gone-gone were the leather jackets and teenage sneers, and in their place were bright clothing and big smiles. With such an ultra-commercial sound and look, Wham! 2.0 became an even bigger success, landing their first number 1 single in Australia and the UK, and their first hit (also a chart-topper) in the US. The song itself had been inspired by a note Andrew Ridgeley left for his parents (which read "wake me up up before you go go" - the first repeated word a mistake, the second deliberate). George turned it into a title and the song fell into place around it - with the singer solely responsible for writing and producing the track. Things had never looked better for Wham!, with their future as one of the world's most popular acts only threatened by one thing: George's desire for a solo career. That would come sooner than anyone could have expected. In 1984, Rod Stewart was up to his 13th studio album in 15 years - a release rate that ensured he was a regular visitor to the Australian top 50 singles chart. This lead single from Camouflage, however, would end up being Rod's least successful hit of the '80s - although, of course, he had many other singles that didn't make the top 50 at all. Despite it being a minor entry in his discography (as far as Australia was concerned), I have clearer memories of seeing the peeping Tom music video than I do most of his other clips. We've seen the end of the Electric Pandas story in other posts (here and here), but here we are right at the beginning when the Sydney band fronted by Lin Buckfield seemed to have a great deal of promise. Debut single "Big Girls" (which I always thought had been even bigger) was an effervescent pop/rock gem that got a lot of support locally, but subsequent releases didn't fare anywhere near as well. When Electric Pandas folded later in the decade, Lin transitioned into a career in TV, working as a journalist and producer for shows like ABC's Four Corners and Q&A. With this lead single from his Body And Soul album, Joe Jackson returned to the top 50 for the first time since 1982's "Stepping Out" - and he had some company. Joining Joe on vocals was singer Elaine Caswell, who'd later perform the original version of "It's All Coming Back To Me Now" as part of group Pandora's Box. This song also marked the ending - although not really a happy one - of Joe's solo top 50 chart career in Australia (although he'd pop up one more time on Suzanne Vega's "Left Of Center" in 1986). More dreary Irish folk music now from the duo behind the phenomenally successful "Maggie" (which re-entered the top 100 this week for another three weeks). 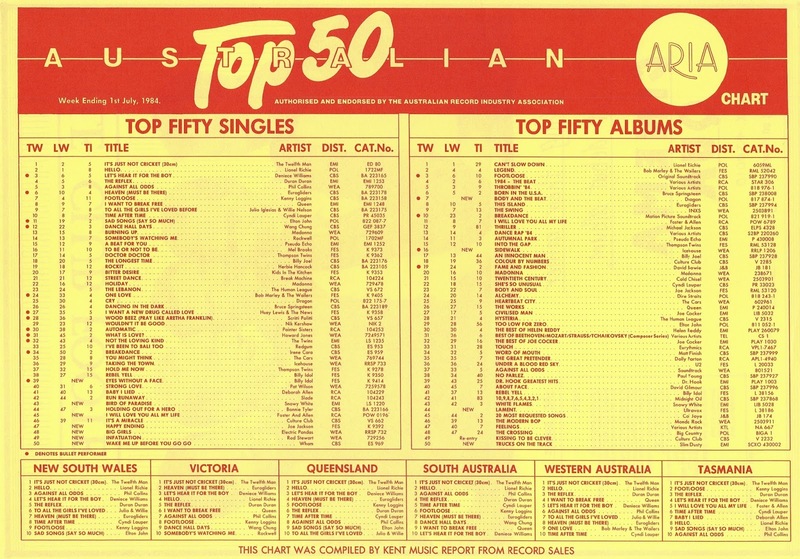 "I Will Love You All My Life" was nowhere near as big - or as enduring - but the LP of the same name did give Mick Foster and Tony Allen their only top 5 album in Australia. Watch the music video below if you dare for some old school "comedy". I have no memory of this song whatsoever. And when I played it just now to see what it sounded like, I drifted off to do something else and forgot it was still going. Yep, that's how much impression the debut single by ex-Thin Lizzy guitarist made on me. Just when you were beginning to think there were no more good songs left this week, our highest new entry was the latest from Billy Idol, who was spending his 15th week on the chart with "Rebel Yell". This second single from the Rebel Yell album was quite a shift away from the types of songs we'd come to expect from Billy. A downbeat synth-rock track, "Eyes Without A Face" proved there was more to the leather-clad rocker than fist-pumping anthems and snarling vocals. Featuring backing vocals - the song title in French - from former Hot Gossip dance and future mother of his son Perri Lister, "Eyes Without A Face" gave Billy a fourth top 20 hit. Next week: why have two concurrent top 50 hits when you can have three? A superstar-in-the-making really starts to dominate, while another classic breakdance song debuts. Wake me up has been too overplayed. 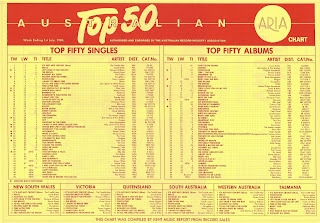 Freedom off the same album gets no airplay these days on Sydney stations, despite it reaching #3 locally. I mean why are so many hits from the 80s, 90s neglected but they play certain hits excessively on smooth & wsfm. That's not to say Wake me up is a bad hit at all, I quite like it & was one of my favs as a child but like Careless Whisper its too exaggerated. I always forget how 'Thieves Like Us' goes. I always thought George Michael looks very Princess Di in the 'Wake Me Up Before You Go-Go' video, with that hair. I didn't spot Caron Wheeler as one of the backing vocalists in the video until someone pointed it out recently. At least I think it's her. I wonder if the French female vocals in 'Eyes Without a Face' were inspired by those in 'Fade to Grey'?